RAISED OUT OF THE ASHES OF LOWELL MASSACHUSETTS COMES LOOSE CANNON. FORMED IN 2005 INITIALLY AS THE KNIGHTS OF TERROR, THEY BECAME A PARTY BAND FOR THE GREATEST BASEMENT PARTIES EVER THROWN IN UMASS LOWELL'S EXISTENCE. 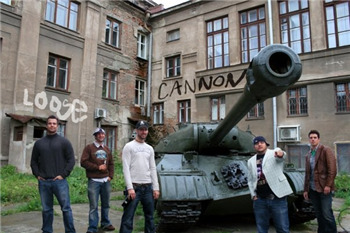 THE KNIGHTS CHANGED THEIR NAME IN EARLY 2006 TO LOOSE CANNON AND HAVE SINCE OBLITERATED THE BAR/CLUB SCENE IN LOWELL WITH FACEMELTING ROCK! AFTER 3 YEARS OF EXISTENCE AND BINGE DRINKING, LOOSE CANNON HAS TRAVELED FAR BEYOND THE RIVERBANKS OF LOWELL TO PLACES LIKE, CAPE COD, UXBRIDGE, AND EVEN THE MECCA OF ALL THAT IS ROCK, HOLLYWOOD. 2008-2009 WILL BE THE GREATEST YEAR FOR THIS BAND AS THEY EXPAND THEIR HORIZONS TO BOSTON AND WILL ALSO BEGIN A WEST COAST TOUR HITTING LOS ANGELES, HOLLYWOOD, AND LAS VEGAS...CHECK THEM OUT WHEN THEY ARE AROUND.. YOU MAY WAKE UP WITH A HEADACHE AND WORRIES OF VD, BUT U SURE AS HELL WONT REGRET THE NIGHT OF BLEEDING ROCKNROLL!